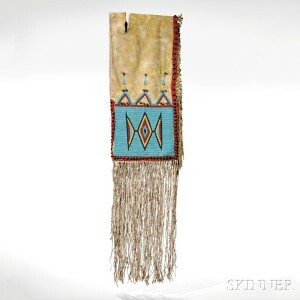 American Indian & Ethnographic Art Auction at Skinner in Boston on November 7th | Skinner Inc. Weapons include a rare tomahawk (Lot 188, Estimate $4,000-$6,000), a fine Quirt (Lot 196, Estimate $18,000-$20,000) and a rifle scabbard attributed to Cheyenne Chief Roman Nose (Lot 200, Estimate $15,000-$20,000). From the Northwest Coast comes a rare Aleutian Island basketry wallet collected by Captain William Trotter (Lot 229, Estimate $6,000-$8,000), a fine Kerf Bent Box (Lot 245, Estimate $5,000-$7,000), an important amulet (Lot 246, Estimate $10,000-$15,000 and a fine Shaman’s pectoral (Lot 247, Estimate $5,000- $7,000). Also included in this sale are a nice collection of 19th century colored lithographs and two fine curtis orotones (Lots 271 and 272, Estimate both at $8,000- $12,000), a small but nice collection of weavings, the highlight of which is a Navajo Third Phase Chief’s Blanket (Lot 289, Estimate $20,000-$30,000). 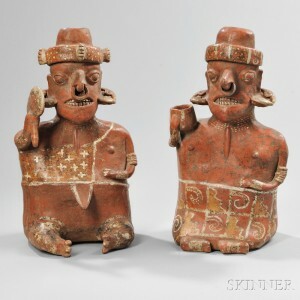 The auction ends with a small but high quality collection of pottery and basketry. Previews for the auction will be held at Skinner’s Boston gallery on Thursday, November 5th, from noon to 5 PM, Friday, November 6th, from noon to 7 PM, and Saturday, November 7th, from 8 AM to 9:30 AM. The illustrated Catalog for sale #2862B is available from the Subscription Department, at 508-970-3240, or from the Gallery. 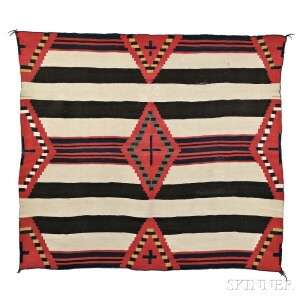 Prices realized will be available online, at www.skinnerinc.com, both during and after the sale. The Skinner website enables users to view every lot in the auctions, leave bids, order catalogs and bid live, in real-time, through SkinnerLive! and Bidsquare. Skinner auctions draw international interest from buyers and consignors alike, with material regularly achieving record prices. The company’s auction and appraisal services focus on fine art, jewelry, furniture, and decorative arts from around the globe, as well as wine, fine musical instruments, rare books, Asian art, clocks, Judaica, and more. Monthly Skinner Discovery auctions feature a breadth of estate material. Widely regarded as one of the most trusted names in the business, Skinner appraisers have appeared on the PBS-TV series, Antiques Roadshow, since the show’s inception. Skinner has galleries in Boston and Marlborough, Massachusetts, as well as in New York, NY and Miami, Florida, with bidders participating in person, by phone, and online. Join auctions live with SkinnerLive! and Bidsquare.For more information and to read our blog, visit the website at www.skinnerinc.com, find us on Facebook, or follow us on Twitter. This entry was posted in News and tagged 19th century, abalone, Africa, American Plains, Apache, Arapaho, auction, basketry, Beaded, belt, bidsquare, biography, blossom, bone, bowl, Cards, carved, carvings, century, Chochiti, Comanche, concha, cradle, cradles, decorative, Douglas Diehl, fiber, figure, figurines, Fort Laramie, Hamatsa, horn, Iatmul, Indian, inlaid, kachina, Kiowa, Kongo, Lakota, leather, Makah, Marquesas Islands, masks, moccasins, Navajo, necklace, New Guinea, northwest, Painted, pectorals, photograph, Pictographic, pipe bags, Plains, polychrome, Polynesia, Pomo, pottery, power, Pre-Columbian, Quinalt, raven, Rawhide, Red Cloud, Sepik Gable, Sepik River carved, sheep, shell, silver, skinner, southwest, spoons, Spotted Tail, squash, Stuttgart, textiles, tomahawk, totemic, tribal, turquoise, weaponry, weapons, whale, William Starring, Woodlands by Skinner. Bookmark the permalink.